The flavors and textures of veggie sushi rolls, in the form of a satisfying grain bowl. I was a vegetarian long before I ever tried sushi. The truth is, after my decision to go meatless (and seafood-less), it just wasn’t high on my must-try list, because I mistakenly assumed that sushi = fish. Then a smarter-than-me friend schooled me – sushi actually doesn’t always have to have fish! Basically, sushi is a wide variety of foods made with vinegared rice that’s shaped into balls and rolled into rolls, along with all kinds of good stuff on and in them. It wasn’t long before I was noshing on avocado rolls, cucumber rolls, veggie rolls, tempura veggie rolls, tofu rolls … basically, I went on a vegetarian sushi roll binge (that, um, lasted years). Such, such good stuff. 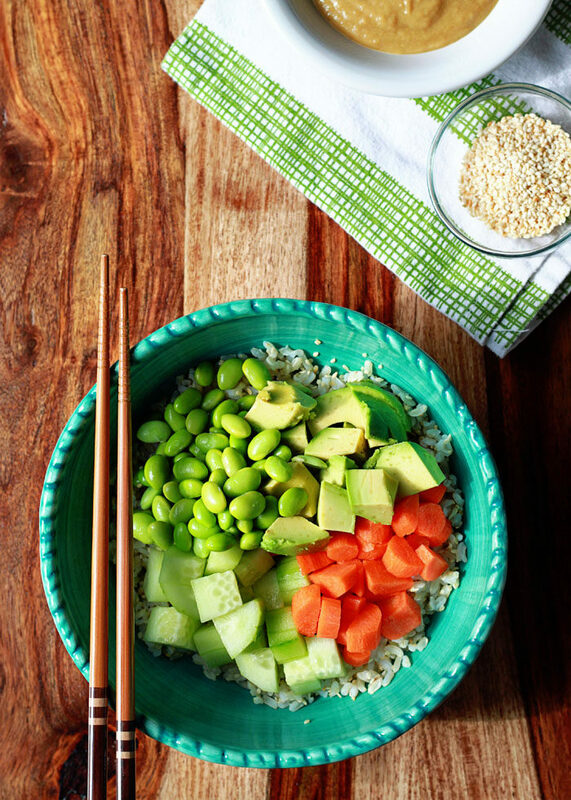 My favorite, the classic veggie roll, was the inspiration for this Veggie Roll Sushi Bowl. Carrots, cucumber, and avocado along with vinegared rice, sesame seeds, and a dressing with that classic must-have sushi roll accompaniment, wasabi and soy sauce. Instead of white rice, I’ve swapped in the healthier brown rice – seasoned with rice vinegar and dotted with toasted sesame seeds. And I added some vibrant green edamame for a hit of protein. And then we’ve got the dressing. The dressing! It’s kind of insane. In a good way. 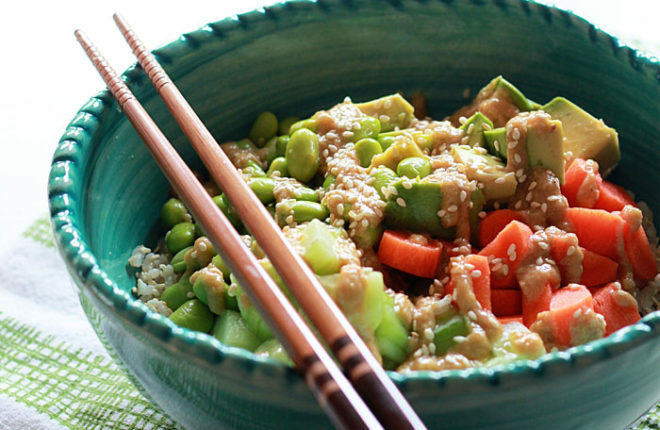 Tahini makes it super creamy and kicks up the sesame flavors (toasted sesame oil helps too). 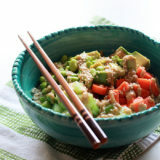 Tamari or soy sauce along with wasabi – a little or a lot, your choice – really bring the dressing to life. I love that this brings together the flavors of veggie rolls without having to, you know, actually roll the suckers. All the flavors of sushi at home, without the work, money, or fish! Win win. In a small bowl, stir together the rice, vinegar, sesame seeds, salt, and sugar. Add all ingredients to a small bowl. Stir briskly with a whisk until combined and creamy. If the dressing is too thick, add a bit more olive oil to thin it out. Place the rice in the bowl. 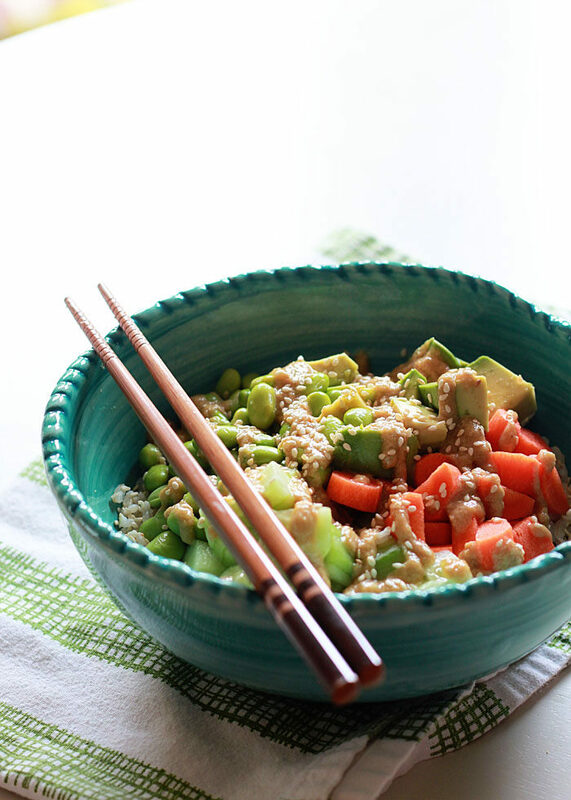 Top with cucumbers, carrots, avocado, and edamame. Drizzle with dressing and sprinkle with 1 teaspoon toasted sesame seeds. Serve. Recipe time does not account for cooking the rice. Add 40-50 minutes if you need to cook your rice first. My favorite way to cook brown rice is to cook it like pasta – seriously! Read about it here. * To toast sesame seeds, add raw sesame seeds to a small saute pan over medium heat and cook, stirring constantly, until fragrant and golden brown, about 5 minutes. This is a weird question/comment but I figure since you know the flavors of the dressing, etc. and I don’t, it is worth a try. This recipe sounds very good. The problem is I can’t have a lot of soy, and edamame would kill me. Cucumbers are a problem, too. So… What do you think would be a good substitute given their flavors and the other flavors (that I can keep) of this dish? Not a weird question at all! I’m on all kinds of food restrictions right now myself – it’s a challenge, isn’t it? I think the dressing would be plenty good without the soy sauce. Just taste and maybe add a pinch of salt if needed. As far as the edamame and cukes go, just sub veggies that are more friendly for you. 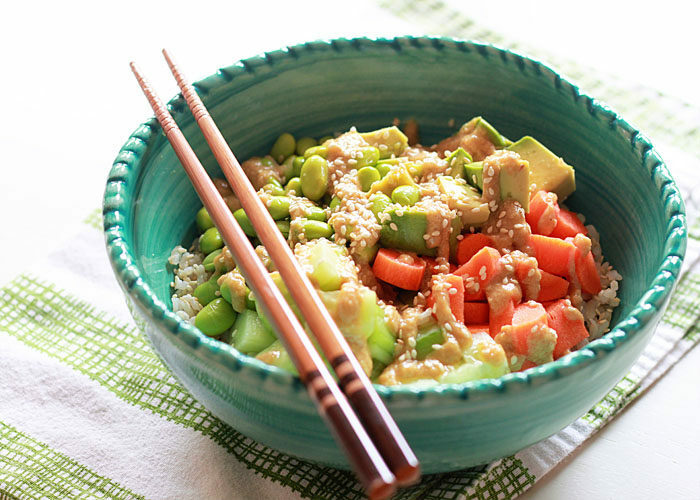 The edamame is there to add protein, so do something protein-based if you like/want. Maybe some beans or lentils or diced chicken if you eat meat; perhaps another crunchy veg like jicama for the cuke? Or more carrots. You could also sub quinoa for the rice for more protein/vitamins. This looks super tasty. I just need to buy some wasabi paste. You have no idea how much you’re helping me out right now. Sushi is the only thing I haven’t managed to tackle making at home, and this recipe looks like the perfect step toward quieting those pesky cravings! This sounds so light and refreshing – the perfect way to welcome in spring! Such a creative way to put a twist on sushi. Love it!! Awesome dish! This is one of my boyfriend and my favorite dishes (he requests it pretty much weekly). Two tasty add-ins we did are some nori seaweed broken apart and sprinkled over the top and an over-easy fried egg to top everything off. The egg might sound random, but it is absolutely delicious with the rest of the ingredients and can add some extra protein. I’m the mom of a newly-minted vegetarian (age 17) and I’m so excited to find this blog so I can try recipes that will satisfy everyone in the family! I’m writing up a grocery list that includes these ingredients so I can try this at home…I might pick up some spring roll wrappers and bibb lettuce too, and see if people want to wrap their own rolls with this as a filling.